In 1968, when the RAF celebrated its 50th anniversary, a former RFC pilot called Oliver Stewart said the objective of a fighter pilot 'was to sneak in unobserved behind his opponent and then shoot him in the back', which got me thinking. Author's Notes Nutshell: It's 1916. The pilots' view of the Battle of the Somme is no healthier than the Poor Bloody Infantry's. "Beneath the insolent wit and ludicrous happenings is a novel essentially serious, whose full impact may be felt only in afterthought." well done... Stronger tastes will relish the whiff of battiness and brimstone." This is now published in a new edition. Nutshell: It's 1917. The war grinds on. Enter Captain Woolley. Exit some unlucky chaps. "...a darkly entertaining read. Every page contains at least one good line of dialogue, one memorable description. You turn the pages, saturated in atmosphere. As writer, Robinson never hits a false note." 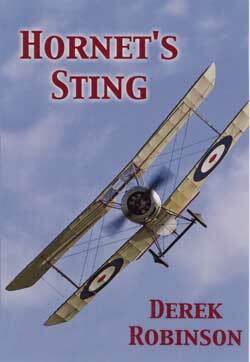 "...the novel...follows Hornet Squadron as it pursues a policy summed up by one former aviator as 'sending obsolescent machines deep into German-held territory' - without parachutes, of course. The wastage of pilots is high and in many ways the novel is Journey's End in the skies except that Robinson has the gift of showing the excitement of flying and that not everyone was fighting for lofty principles of King and Country. "Robinson is a better story-teller than Jeffrey Archer, Ken Follett or Wilbur Smith; his prose is as full of care and colour as most of the Booker winners.His is a rare achievement...the creation of a poetry of action." Nutshell: It's 1918, and Woolley, now squadron commander, seeks out chivalry and shoots it down in flames. "Fit to sit on the same shelf as Waugh and Heller... Robinson's recreation of the exhausted savagery of 1918 is truly shocking... the descriptions of flying are brilliantly vertiginous; nobody puts you in the cockpit like Robinson." The R.F.C. trilogy will be available in print from MacLehose Press in bookshops in January 2013. The R.A.F. quartet is already available. None of these books will be available in North America. down copies. Almost all titles (except A Splendid Little War) are available as e-books.